Let's get back to the latest and greatest from Quilt Market! This is where industry professionals find out about the swankiest products for their quilt shops, and it all takes place in Houston, right before the awesome quilt show referred to as Quilt Festival. 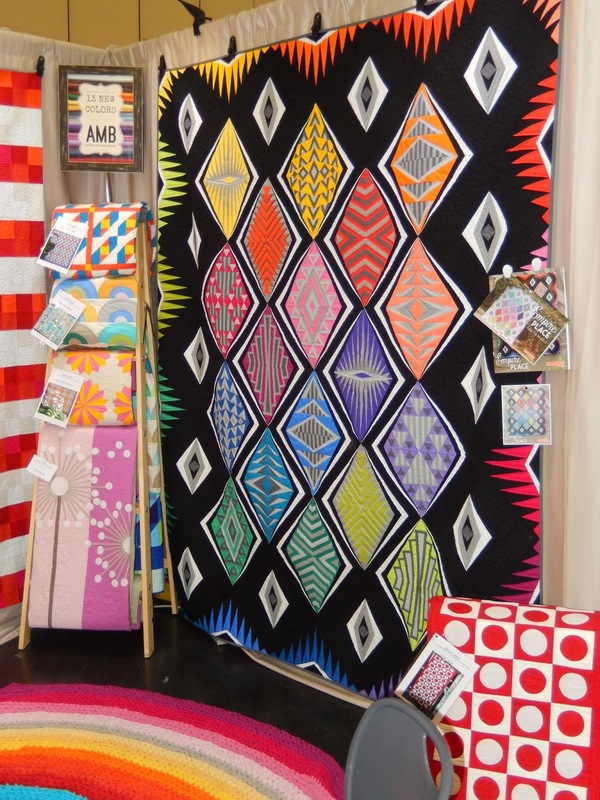 American Made Brand had a vibrant booth chock full of quilts. This one is Sassafras Lane's new paper-pieced block of the month, Empire Place. Robert Kaufman has some tempting new lines. Angela Walters introduced Fragmental. If you missed my post from her Schoolhouse Session, go ahead and check it out. The quilt shown is Fractured Fragments, a free download. Carolyn Friedlander showed off her classic architectural style with Carkai. Can you tell she's a bit of an introvert, given the camouflage fashion? Liesl Gibson unveiled her Woodland Clearing cotton lawn collection, due to stores early next year. The prints recreate her beautiful watercolor paintings. Elizabeth Hartman has a new line of fabric, Pacific, as well as some funky patterns including Legendary (right) and Fancy Forest (left). Don't you just love them all? Conveniently, I have a giveaway that might help you get your hands on a little of each, even though some of the fabrics aren't even in stores yet! Great pics .Thanks for sharing! I love your comment on camouflage clothing and I also love the Woodland quilt. Now following you on bloglovin.